This will be a very short post for now, as I'm totally exhausted ever since coming back from Japan, just doing an update post to say that I'm actually alive and not MIA in Japan (though I wish that was the case lol). I promise to do a proper post tomorrow on the Japan trip. Spent the whole day today doing unpacking of my luggage, then cleaning up my room and planning how I'm going to arrange the goods and posters. Not to mention I'll need to go through about 8-9GB worth of photos and choosing which photos to post up. 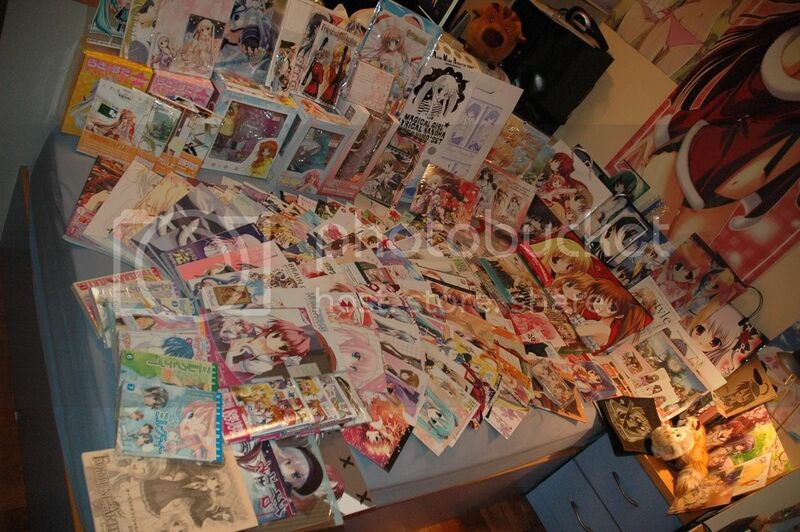 Just for teaser, here's a picture of the loots that I brought back from Japan. Not included in the picture is a Little Busters's Noumi Kudryavka dakimakura, a To Heart2 Sasara Kusugawa Sports Towel, a Shakugan no Shana's Torch T-shirt and a Gurren Lagann emblem T-shirt. I have not calculated the full cost of all my purchases, but will try to do so tomorrow also. Stay tune for a proper post!! P.S: I'm really sorry for not posting sooner as I'm really really exhausted, hope that everyone would understand. I'm so tired that while rocking Mikaela's cradle (my newborn niece!! photos to come soon too! ), I actually knocked out, only to awake when she started crying lol. That has got to be one of the most massive purchase I've seen in my entire life!! Well it sure is my own personal biggest purchase ever, and I don't think I'll be able to do it again. But who knows maybe if I managed to save up enough I might? lol? Buying is one thing, carrying it all back is another! It sure was heavy!